Tonight I received an email from Steven Luxenberg about Annie’s Ghosts. It’s ready to be released in paperback tomorrow with a new cover. 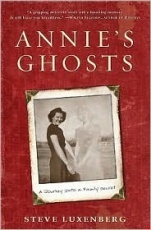 My review of Annie’s Ghosts from July 2009 is still available for view. Isn’t this a nice cover? Washington Post associate editor Steve Luxenberg is a master of investigative journalism. The editor of two Pulitzer Prize-winning series, Luxenberg has now written his most compelling story: his exploration of his late mother’s secret. Beth Luxenberg always claimed to be an only child, but a chance mention led to the discovery that she had been hiding the existence of a sister, Annie. The girls had grown up together, living in a series of cramped apartments until Annie’s commitment to a mental institution at the age of twenty-one. Why was Annie committed? How had Beth so thoroughly erased her sisters existence? Why had she wanted to? That’s a small blurb from the FSB Associates press release for Annie’s Ghosts: A Journey Into a Family Secret that gets to the heart of Luxenberg’s questions. This is currently my favorite non-fiction book of the year and should be added to book club reading lists. A big thanks goes to Julie at FSB Associates for introducing me to this book. When I heard Luxenberg’s interview on NPR I found him to be engaging and hoped his writing would be the same. Every family has secrets, whether they know them or not. Sometimes they die with the people who know the secret but in this case Beth Luxenberg’s secret took on a life of its own. Because this secret involves his mother and an aunt he never knew, he has an emotional investment in what he finds. Every good detective story has a reliable narrator that tries to make the dots connect and Luxenberg serves that purpose well. He doesn’t hold back information to surprise the reader or create shock value. If any information is held back it’s because it’s revealed in approximately the same timeline in which he learned it. This provides the reader the thrill of what was formerly thought to be a dead end as a new avenue of information. Edmund Wilson is often quoted with “No two persons ever read the same book” because the reader brings their own experiences and interpretations to a book. One of my points of reference while reading this was Clint Eastwood’s The Changeling. Imagine my surprise when Luxenberg used this movie as an example in yesterday’s guest post, but from a different angle. The main character is institutionalized against her will and meets other women in similar circumstances. Luxenberg educates the reader about the Michigan mental health system and changing attitudes towards psychiatry in an interesting way without it being boring or overly technical. He sheds light on how a man or woman could find themselves involuntarily admitted into an institution for life. In the last 30 years amazing progress has been made in the fields of psychiatry and orthopedics. It gives the reader hope that today’s disabled and mentally ill people have a better quality of life than Annie and makes the reader sad she was born before these advances. This journey does make Luxenberg evaluate what he knows about his parents. Though he can understand his mother’s motivations for keeping her sister a secret he never judges her. And that’s one of the main reasons why I like this book. Why do so many film makers put “based on a true story” or some variation as one of their opening frames, when they have freely altered the truth of the story? Because it works. Because those words retain their mesmerizing power, even though they are misused or stretched at times to the point where there’s little relationship between the story being told and the facts that gave rise to them. Truth-twisting in film has become so accepted that reviewers rarely comment on it or point out the discrepancies between fact and fiction, between information and invention. As a long-time journalist and a first-time author, I’m probably more fascinated than most people at the transformation of a nonfiction work from book to screen. In researching and writing about a family secret that took me back to the beginning of the 20th century, I chased down many leads to ambiguous and not entirely satisfying conclusions. I joked with friends that I envied the novelist’s license to invent what could not be learned or verified. Instead, the trend line is moving in the opposite direction. Recent case in point: The Changeling, starring Angelina Jolie as the mother fighting a corrupt Los Angeles police department that had declared a stranger to be her abducted nine-year-old son, begins with the words “a true story” appearing on a black screen, holding for a few seconds, and then fade out. Not “based on” or “inspired by.” Just that flat, unambiguous statement: “a true story.” Then, in the fine print at the end the closing credits, the film makers fess up. “While this picture is based upon a true story,” we’re told, “some of the characters have been composited or invented, and a number of incidents fictionalized.” In other words, (which I liked and admired for its storytelling as well as its artful re-creation of the 1920s) improved on the remarkable tale of Christine Collins and her young son Walter. The true story wasn’t quite good enough. Moviegoers seem to accept this hybrid genre, and the industry celebrates it (Oscars, etc.). Is it any wonder that it has crept into the world of nonfiction books, where memoir writers have claimed a license to “fill in the gaps” (based on truth and memory, of course)? Or that universities now offer courses in “creative nonfiction”? Truman Capote gave us the “nonfiction novel,” stealing a page from the film world. Tom Wolfe chose to take his new journalism into novels, which solved that problem. James Frey obviously crossed the line, however, in embellishing and inventing some of his 2003 memoir, A Million Little Pieces about his drug use and brushes with law. A screenplay version of Frey’s work could have said “a true story,” and no one would have batted an eye. Frey’s right on one score: Others disagree, and there’s a lively and continuing debate in the writing community about these issues. On a Facebook discussion the other day, for example, the question came up: How far should memoir writers go in reconstructing scenes and dialogue? I draw a harder line than most. I favor the rough edges of memory over neat and pretty reconstructions. (More interesting, usually.) Invention? As I wrote in the Facebook discussion, that’s why we have novels. Readers, I think, are smart. They know that most writers don’t have notes or documents to back up dialogue from long ago. So what’s the problem? In a word: Credibility. As a writer, I want readers to grant me some license to tell my story. But if I present lengthy dialogue as fact, I risk losing their trust — and their interest. Bad deal for me. There’s a scene in my new book, Annie’s Ghosts: A Journey Into a Family Secret, that illustrates the difficulty of reconstructing past events. I’m at a restaurant outside Detroit, interviewing a cousin about the secret that stands at the center of the book. The secret was my mother’s. Throughout her life, my mom had hidden the existence of a disabled sister. I was trying to find out why. My search had led to my cousin, someone I had never known. In the early 1950s, I learned, my cousin and my mother had argued about the secret, leading to a life-long rift between the two women. Just as my cousin is recounting a climatic moment in their dispute, we’re interrupted by the waitress’s offer of coffee. After the waitress leaves, my cousin resumes her account — and offers a different (and more dramatic) version of the key moment she had described only seconds before. I had no doubt about the crux of my cousin’s story. My mother had, after all, kept the secret. But if I wanted an “accurate” version of their conversation, I was out of luck. My cousin was giving me the version that reflected years of thinking about that moment, that reflected her feelings as much as her memory. I saw no reason to choose between the two versions. I would present both, and use the scene to point out the intricate patterns of trouble imposed by time and memory. That would be better than presenting a reconstruction of their argument. That would be something closer to true. Steve Luxenberg has been a senior editor with the Washington Post for twenty-two years, overseeing reporting that has won numerous awards, including two Pulitzer Prizes for explanatory journalism. He lives in Baltimore, Maryland. I have several book reviews I need to finish writing before the end of the month. 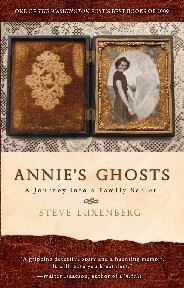 This week though, you’ll see a guest post by Steve Luxenberg, author of Annie’s Ghosts: A Journey Into A Family Secret. On Friday my review of his book will be available. He’s doing an Author Chat on LibraryThing starting today until the 29th. Next week on the 22nd you’ll find a review of The Wolves Keeper Legend and an interview with the author, Sylvia Weber. Last week I listened to a Kathy Griffin interview on NPR on my way into work. At one point she mentioned she knew NPR listeners were readers. Poor Kathy either forgot to mention or it was cut out that her own book is being released in September. The title is a plea for Oprah to read the book and recommend it – Official Book Club Selection. I’ve found more than one book added to my TBR pile or Amazon Wish List because I heard the author interviewed on NPR. The most recent one was Annie’s Ghosts which I really enjoyed. Have you bought a book after hearing an author speak about it? On the other side of the coin, if you’ve had a book published, did you find the sales increased after doing radio interviews?